Assist in implementing “hotspot” crime prevention and housing acquisition strategy throughout the East End. The hotspot strategy implementation is essential to stabilize the neighborhoods in the East End. This strategy requires overall coordination to select, purchase, rehab, and maintain selected properties. The hotspot strategy not only improves the community’s safety but also significantly helps increase housing options. Transform low-income communities with distressed and abandoned housing and vacant land into stable communities with energy- efficient, mixed-income housing that is physically and financially viable over the long term. 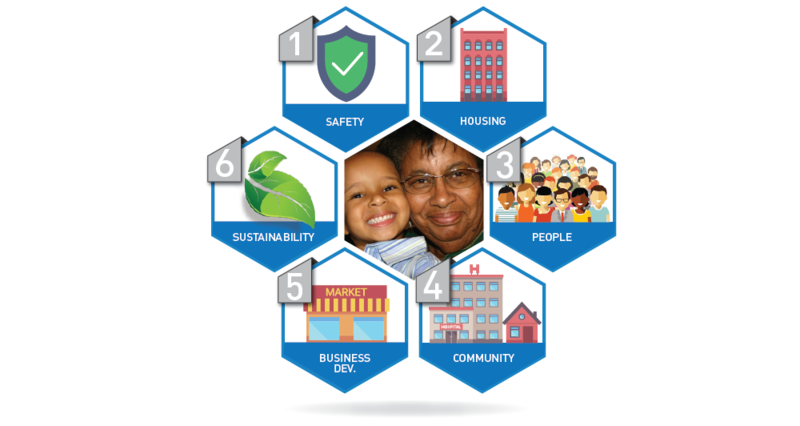 Support positive outcomes for families who live in the target communities particularly outcomes related to residents’ health, safety, employment, mobility, and education. Transform communities of poverty into viable, mixed-income communities with access to well-functioning services, high-quality public schools and education programs, high-quality early learning programs and services, public assets, public transportation, and improved access to jobs. Develop ecologically sustainable neighborhoods that incorporate principles of Green Enterprise Standards, storm water management, energy production, open/green space and options for food production.